Rattan is a weaving material which has been imported to the UK from South East Asia over several centuries. It is often called cane, but should not be confused with bamboo cane, which is quite different. Other common colloquial names include Palum Bang, and Kubu. Rattan is an extremely long tendril like plant. It has rather vicious spines when first harvested, and these are removed when the outer skin is removed before export. In cross section it is dense (in contrast with bamboo which is hollow). 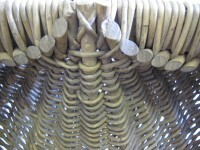 It was initially imported for use in furniture, and it is difficult to know when it also began to be used in British basketry. 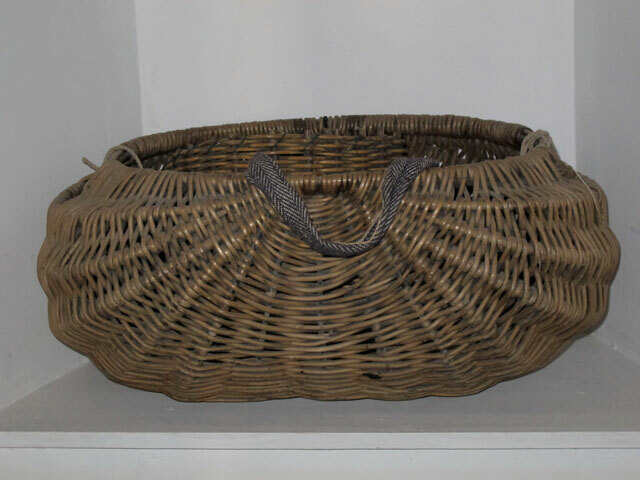 Its value for basket-making, especially for work baskets such as those used in fishing, lies in its durability, its strength and its resistance to pests such as woodworm. It can be recognized by its scale-like surface, its fibrous core, and its length, which means that any basket made from it will, unlike willow, have very few ends. A quarter cran was used in the herring industry. Originally they were made in willow and hazel but later came to be made in rattan.